If you are a fan of "Harry Potter" you would definitely know about the platform "nine and three-quarters" of the King's Cross Station in London, the boarding station to Hogwarts School of Witchcraft and Wizardry. 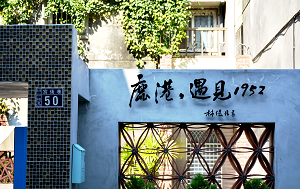 If you are from out of town and would like to have a memorable overnight stay in this quaint township, look for the quiet Gong-hoe Alley behind the famous Lukang Mazu temple (Temple of the Heavenly Queen), located between the bustling Zhongshan Road and Fuxing Road. Strolling through the alley following the faint aroma of laurel as if twirling a fragrant petal between your fingers, a six decades old brick house will be in your arm's reach within a few steps, standing there like it has been expecting you all the time when you cross through the platform "nine and three-quarters" to begin the most exciting chapter of the journey of your life. 「Lukang, Encounter of 1952 」is waiting for you to experience some of the most beautiful and romantic encounters of your life.